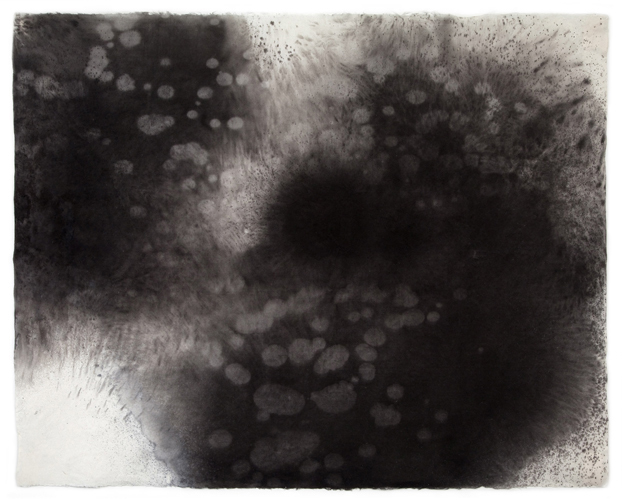 Just recently, I read of an exhibition opening at New York's June Kelly Gallery entitled "Water Works: Surface Tension", with drawings by Sky Pape. I was intrigued and delighted: this Canadian artist, living in New York, is creating drawings that I find beautiful, sensitive and highly unusual. Sky Pape is pushing out the boundaries of the definition of drawing in a way that marries physical - and I mean her whole body, not just arms and hands - with intellectual and true global awareness. She uses the traditional drawing media - save for silverpoint, apparently - but in totally new fashions. Her papers are from many sources, but all with environmental and societal considerations. Tibet, Nepal, Korea and Japan are some of the paper-making sources, and she views her work as "a collaboration with those distant paper-makers in Asia", as she folds, cuts, amalgamates and reverses the different types of paper to create her work. Her mark-making media range from graphite to coloured pencil to ink - humble, traditional and simple media, but she uses them in very different fashion. For instance, she blows ink through tubes and funnels onto these handmade Asian papers that she has spread on the floor. Building on her belief that drawing is at the centre of any art, she is combining a physical expressiveness with a recognition that the paper is part of the creative dialogue, and it too symbolises nature in all its manifestations. The minimalist and elegant drawings that result from these unusual approaches are evocative, and satisfying - even seen in digital form. How much more worthwhile they must be to see in person, one can only imagine. Having had the fun of studying many of her drawings on her website, I am not at all surprised that she will be spending March this year in Bellagio, Italy, on a grant from the Rockefeller Foundation. There are many many wonderful draughtsmen working today, but I am always thrilled to find an artist who is not only pushing out the boundaries of drawing media but going so in an uplifting fashion that makes me go "Ah!" with pleasure and interest. See what you all think of Sky Pape.